I’ve just moved up to training level in eventing with my 8-year old Hanoverian. It is going well except when we get to the water drops, where he is apt to refuse at the last minute or put the brakes on as soon as he spots the water behind the drop. There are two issues that I’d like help addressing: One is his dislike of water and the other is how to recognize and deal with a horse that is “backing off” from an obstacle, as I imagine there will be other “questions” that he finds intimidating. In terms of his dislike of water, I can only get to a cross country course at most once a week. 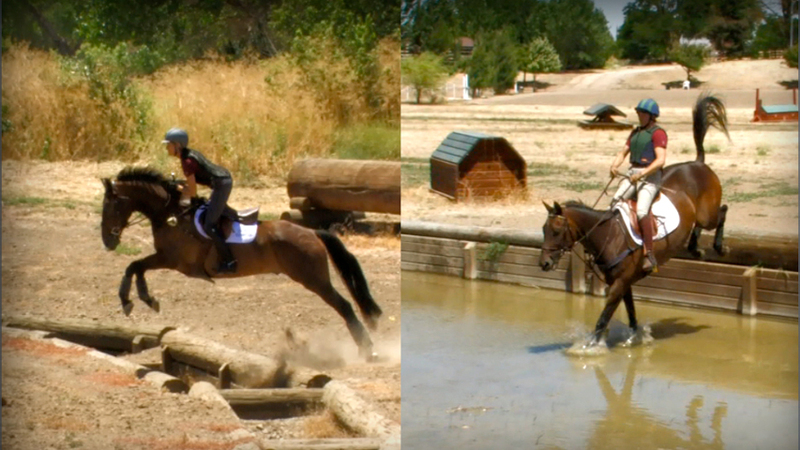 In season, I have started to work on the water jump each time, mostly taking it slowly (eg. cantering in, jumping in, then going off a few banks). After a bit of work he is now fine cantering through and jumping over a log into the water. However, if I don’t go slowly and ask for the bank jump as if I’m on a course, it is a 50/50 whether he will go, even for banks he did the week before. And he has a consistent stop for water banks he has never gone down. It might sound silly, but I was wondering if taking him somewhere to go swimming might help with his reluctance with water. He seems genuinely concerned about jumping into unknown footing. We would be winning if I could get him over this problem. On another note, he obviously doesn’t trust me enough to jump something that he fears. What should I do when I feel him “backing off” from these jumps? The only thing I’ve found effective is to turn my crop upside down and whack him hard, which is against eventing rules. Fear of water, like fear of ditches, seems related to the unknown. The horse can’t fully see what he’s expected to jump, and that causes the spooky ones to back off. Your best bet is tons of desensitizing, in and out of as much water as you can find, trying to get him over his fear. Some get past it, and some don’t. Another thing you might try is to have him follow a brave leader, because horses have that herd instinct. That feeling that the horse is backing off is probably because he’s nervous. Usually getting too much on his case makes him more nervous, and I’d try the quiet approach first, and see if he starts to get used to going forward when he sees water. Your issue is a common one and I’m hopeful some of my tips might help you! I’m a big believer of starting horses cross country “on-line.” I use a Parelli style rope halter and line, but a lunge line can work as well. The benefit from this is huge in particular for introducing horses to banks, water and ditches. As riders we do our best to show the horse the “question” and help them through it. Unfortunately, even the most talented and tactful rider can interfere with the horse finding their own balance when learning how to navigate these obstacles. The BIGGEST mistake we make riding a horse down a bank is holding their head up/reins too tight. The horse has to be able to drop his head and neck to look where he’s going and also balance. When you allow the horse to do these obstacles “on-line” they are able to look, think and decide how to best deal with it. Because of this, I recommend you first get the horse comfortable doing these obstacles without you on his back. I recommend you have your trainer or a trainer who’s comfortable using this technique help you. 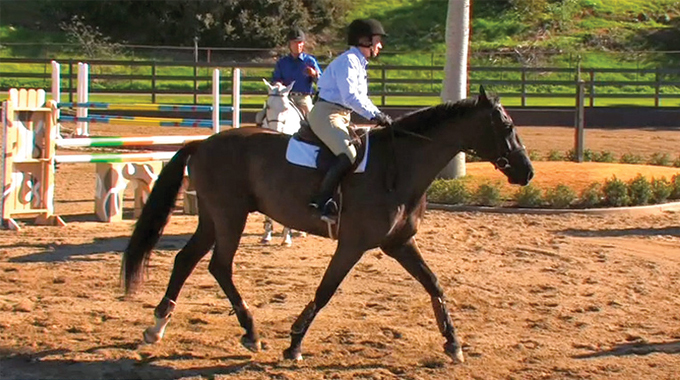 Be sure the horse lunges confidently and properly. 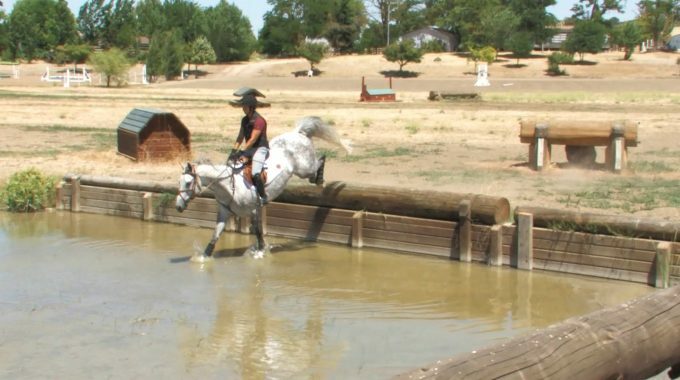 Lunge the horse through the water (without a jump/bank) both ways until he’s confident. Introduce a bank “on-line” going up first, then down, without water. 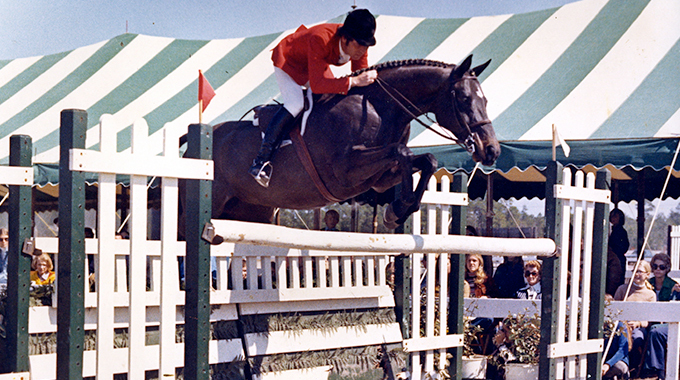 You always want to do the up-bank first so the horse understands the concept of the obstacle. Do this until the horse is confident. Lunge the horse leaving the water with an up bank. Then into the water with the drop. If you do this frequently and until the horse has a desire to go into the water and understands he won’t be inhibited by your hand or balance, then he’ll start to trust himself and his footwork. This technique works great for ditches as well. After your horse is very confident on-line, then you can do it on him, but make sure you keep a soft elbow and hand. 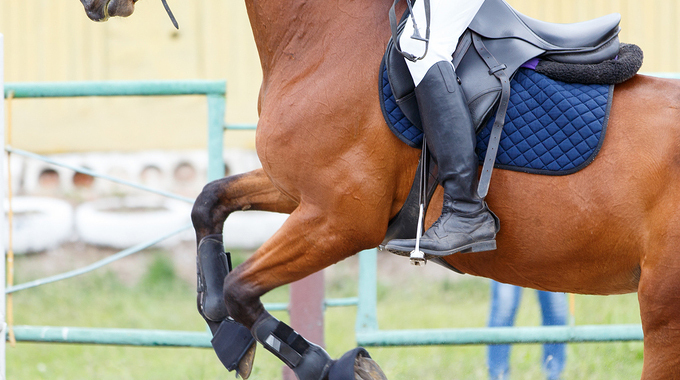 If you have difficulty with your timing, try slipping your reins before you even get to the drop, you can even have your trainer lunge the horse with you on him so you don’t feel the need to “grab” the reins. Remember to be patient and always try to look at these obstacles from the view of the horse, this will help you break it down for them. Good luck!